You may not think that yeast extract has anything to do with beer, well you would be wrong. Yeast extract is made from a by-product of beer production, have you guessed yet, yes it's yeast. Many people love yeast extract, just as many do not, I am with those that do. 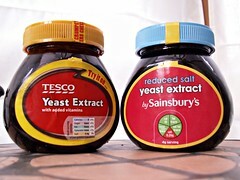 Marmite is the big name in yeast extract, but there are many others and for years now I have favoured Tesco's own brand yeast extract over Marmite (although they are all probably made by the same people). During our weekend away though, I discovered Sainsbury's reduced salt yeast extract and like it just as much as Tesco's, so I will probably be changing my allegiance to Sainsbury's. For those of you thinking, why hasn't he mentioned Vegemite, well the answerer to that is simple, I do not like it.